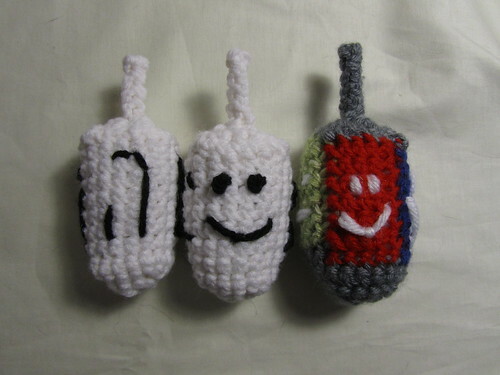 Curiously Crafted Creations: Celebrate Hanukkah with a Free Amigurumi Pattern! 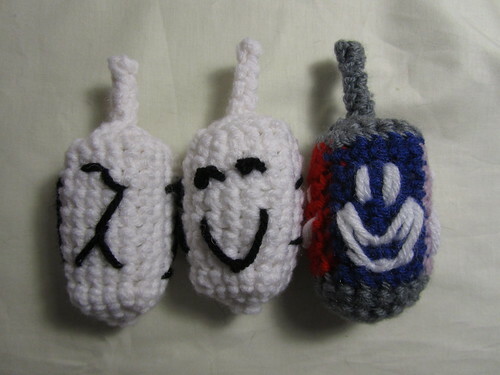 Celebrate Hanukkah with a Free Amigurumi Pattern! Only somewhat known fact about me: I'm Jewish! And one of my favorite holidays of the year is Hanukkah. I've already got my menorah and candles all ready for tomorrow, and I'm pondering potato latkes and gelt. 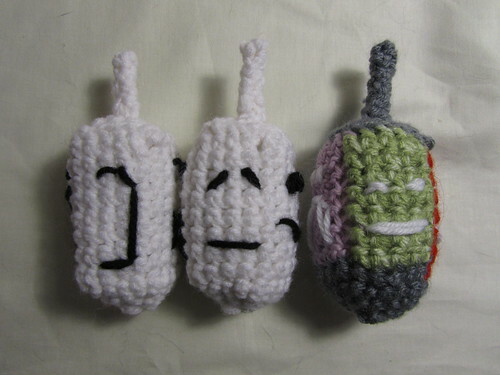 While these things wandered through my brain on Sunday morning, I had a moment of insight - a design for a cute little amigurumi dreidel. 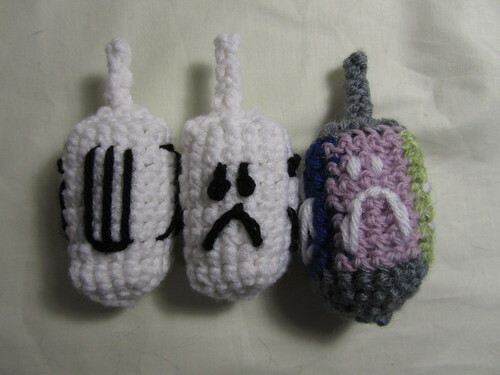 Cause really, Hanukkah ain't complete without a dreidel! Here's how to make your own! Note that I've made this pattern three times, so I know it works, but I've not had it tested by any other person, so there is a chance it'll be a little confusing. If you have any trouble, just let me know!! 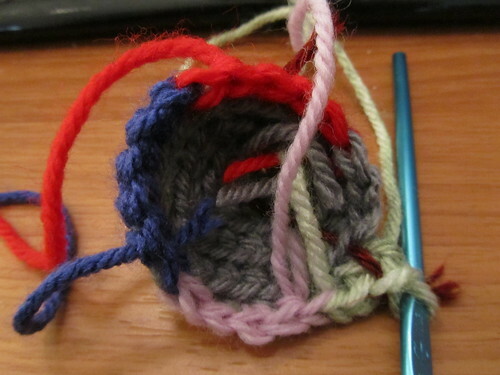 :) Also, here are two links that helped me design this: How to Crochet a Cube and Magic Adjustable Ring Tutorial. If you want to make it in one color, just ignore all the color switch instructions. 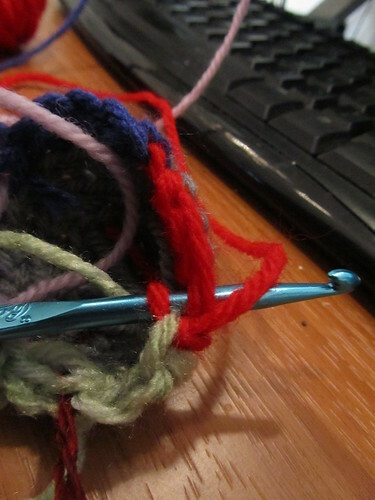 I encourage you to use colors, though - this pattern is a great way to use some scraps! Sc in next 2 sc, ss in next st, tighten in finish off. Ch 1, tighten, and finish off. Leave a long end for sewing. 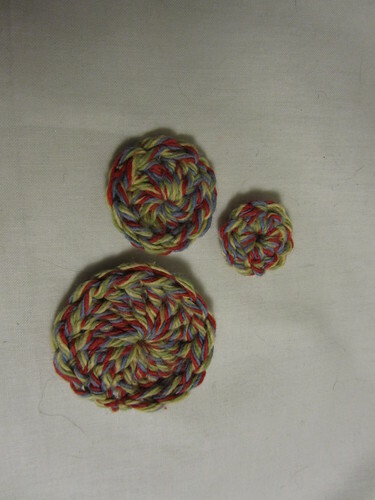 Stuff the base of the dreidel with fiber fill, then sew the top over the top. Make sure you line up the corners of the square top with the color transitions on the dreidel (or, if only using one color, that your corners line up with the corners at the base). When you've got three sides sewn on, stuff in a bit more fiberfill. Don't over stuff, though - make sure the top stays (relatively) flat, instead of puffing out. Ch 2. In second ch from hook, sc 3 times. From there, work in a 3 sc spiral until it's one inch long. Ss in next sc, tighten and leave a long end for sewing. 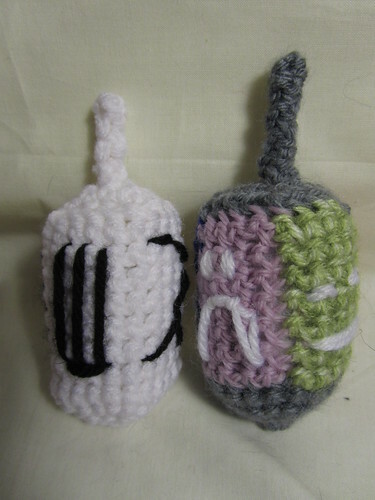 Sew the handle on to the center of the dreidel top. Next, you can decorate your four sides with images that reflect the four sides of a dreidel - the key to how you play the game. First, here are the rules on Wikipedia. Now, the way I learned - which is a little different, is as follows. Dreidel is a gambling game, and you start with a pool of something to gamble with - for us, it was always either pennies, candies (like M&Ms), or gelt (that chocolate wrapped in gold foil that looks like coins). There are four sides on the dreidel, represented by the Hebrew letters gimmel, hey, nun and shin. Which of these turns up determines what happens. If you spin a gimmel, you get the entire pot. This is the best result. If you spin a hey, you get half of the pot. This is the second best result. If you spin a nun, nothing happens. This is a neutral result. And if you spin a shin, you lose your entire stash. This is the worst result! Now, if you're gonna play, I suggest you use wiki's rules, they're more functional, but mine get the idea across: four possible results, one awesome, one okay, one neutral, and one lousy. I thought it would be fun to represent this with different looking smiley faces. I also made one dreidel with the traditional symbols. Consider these pictures to be some ideas on how to decorate yours - but feel free to have fun with it and use whatever random embroidery stitches you might know!! Now that you've made your dreidel, though, you need something to gamble for! 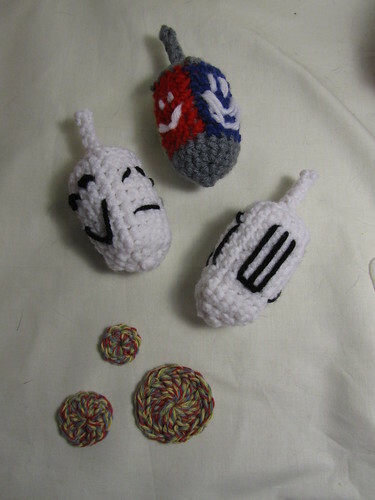 How about...some amigurumi gelt? Of course! 10 sc magic circle. Join with a ss, tighten and finish off. 12 dc magic circle. Join with a ss, tighten and finish off. 16 tc magic circle. Join with a ss, tighten and finish off. You're too much! I love all of them and they look easy to make! And no, I did not know you were a MOT! Oh yay, I'm so glad to hear that! You're the first person I know for sure has made it! :) Thank you for this feedback!! Santana Squid - A New Amigurumi!